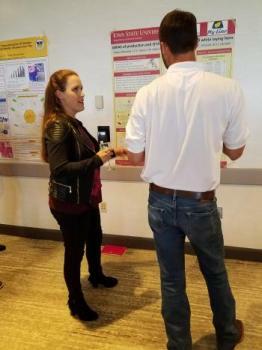 Kaylee Rowland, PhD student in the Lamont group, won third prize for her poster presentation at the National Breeders Roundtable in St. Louis. The title of Kaylee's poster is " GWAS of production and iSTAT traits in heat stressed white laying hens". The National Breeders Roundtable is an annual meeting that brings together breeder specialists and geneticists from industry, universities, and government to discuss the latest poultry breeding research and developments, along with genetic trends.